Andrew Arthur George Canoutas was born January 29, 1935 in Wilmington. Andy’s dad came to Wilmington from Greece in 1923. His mother, Lola Shukri, also Greek, was a British citizen who taught at the Greek school in Wilmington. In 1942 – 46 they lived in Virginia but came to Kure Beach every summer on vacation. In 1946 they moved permanently to the SE corner of 421 and K Ave where Jack Mackerel’s is now. Andy lived upstairs. Downstairs was the Canoutas Restaurant with full-service breakfast, lunch and dinner- fish, steaks, chops, fried, & broiled; and a lot of Greek salads – one of lettuce, tomatoes, onions, olives, feta cheese, and a special olive oil and vinegar dressing. When the Ocean Inn disappeared, George Stathis came to work. Son Andy worked at busy times at night running the cash register or waiting tables but not cooking. His dad rented ten rooms and three apartments over the Canoutas Restaurant and beachwear shop. Andy’s mother had a beachwear shop on the east side of the restaurant on K Street. She also had BINGO sandwiched between the restaurant on the corner and the beachwear shop. Originally, in the 40s, two duckpin bowling alleys ran lengthwise here. Andy called BINGO – “On the first row, B, number 5… BINGO has been called, please do not disturb your card until checked… player could be wrong.” Tourists and local men and women played every night except Sunday. Depending on what type of BINGO you got, winners might get $5, 10, 25, or the big prize at night, $100 coverall. They could play as many cards as they wanted. First they had little windows that closed. Then they used little round plastic chips. When the BINGO ended, his mother expanded the beachwear shop. 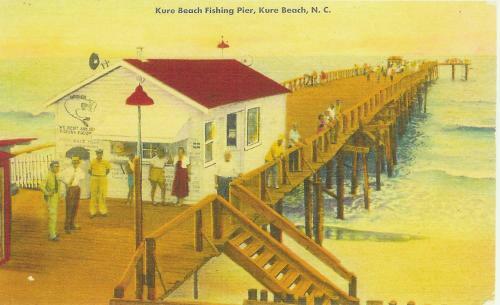 Kure Beach was called a family town, ’cause families were all that came down here. The only outsiders that came down here was during fishing season. Kure Beach was well known as a fishing beach. A guy on the pier in overalls might be the State Treasurer.